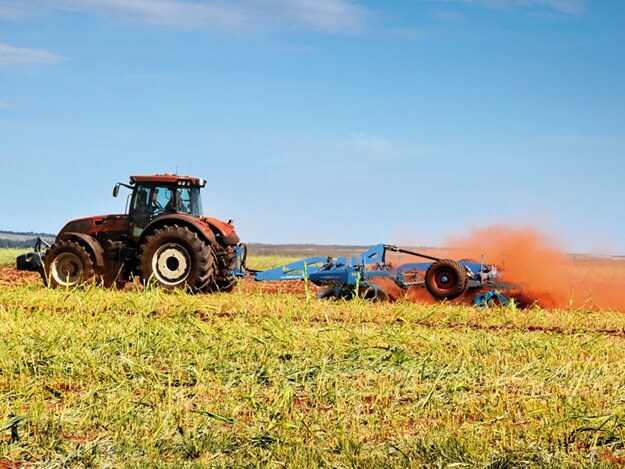 Using the latest planting and harvesting machinery money can buy has helped build a South African farm into the biggest carrot producer in the country. 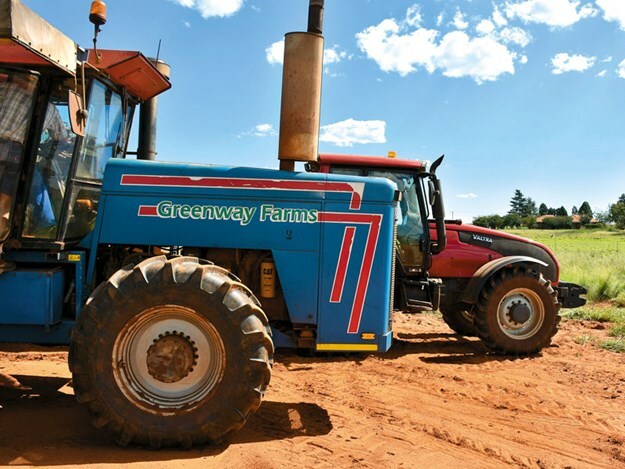 With its headquarters at Tarlton, Greenway Farms Ltd handles more than 60,000 tonnes of carrots per year, selling the majority into the fresh vegetable markets. Run by business partners Vito Rugani and Vincent Sequeira, the company grows 2500 hectares of vegetables with irrigation pivots on three separate farms. 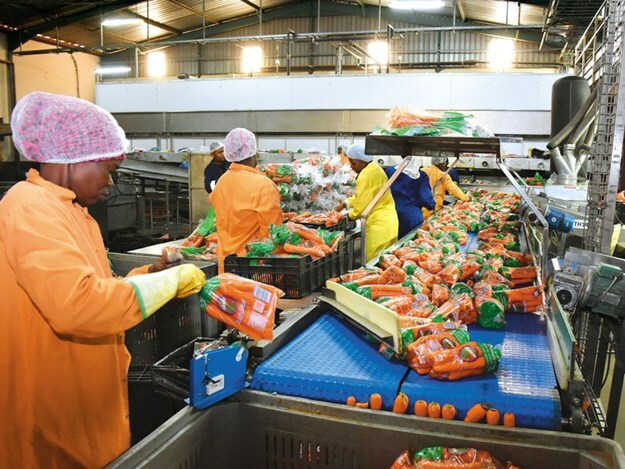 Producing the best-quality carrots in the country was the ultimate goal for chief executive Vito and now, having achieved that, the focus has moved to a new value-added product. Two years ago, Vito and the team embarked on a journey to produce Rugani carrot juice, but now they have big plans to extend this juice extraction process to other vegetables as well, possibly even to produce sweet potato juice. 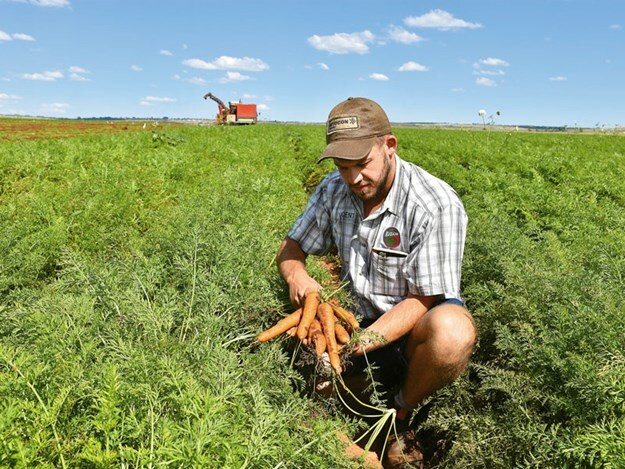 Carrots have a four-month growing season, so Vito staggers his own growing process on the three farms to ensure an even production all year round. 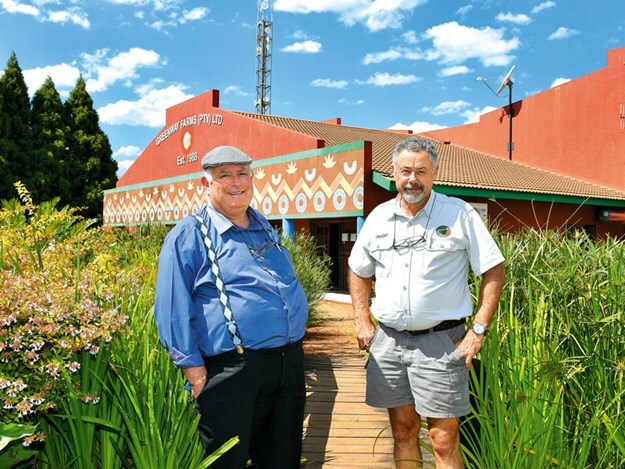 One farm is on the highveld of Tarlton, Gauteng Province, about 75km west of Johannesburg, and the other two are located at Boskop in the Waterberg in Limpopo and Christiana in the Free State. Each location was specifically chosen to supply carrots in its own optimal season as they each have different soil types and climatic conditions. However, operating three farms with different planting and harvesting schedules takes a lot of organising and planning. The company employs 250 staff on the farms and in the carrot processing plant to keep the business rolling. Vito says the decision to juice carrots was an easy one to make once he was loaded with all the correct information regarding the extraction process. 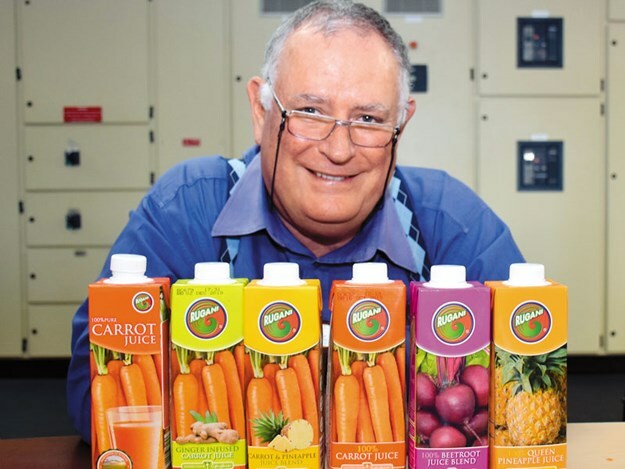 "Just under two years ago, we decided to add value to the carrots by building a processing plant that extracted the juice from carrots producing an entirely natural food product that has a shelf life of 18 months," he says. 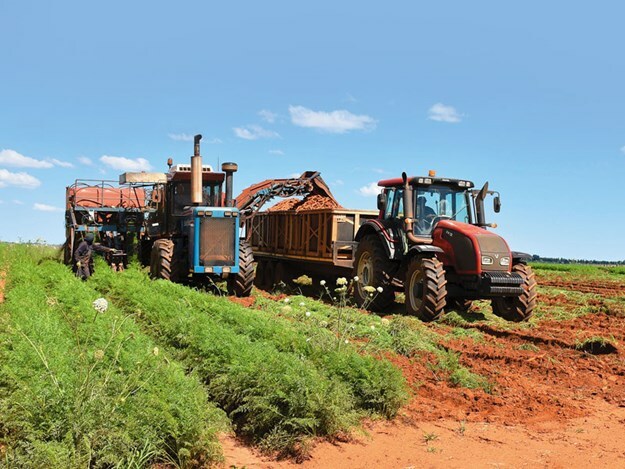 "While juicing carrots currently only utilises three percent of all the carrots, the team grows at Greenway Farms, that particular side of the business is starting to take off. "Considering there are only 100 farms producing 80% of all the carrots in the world, this demonstrates how specialist these farms are. Vito uses 12 species of carrots on the farms, including Vilmorin, but also others developed in The Netherlands and France. "Normally, there are about one million carrots produced per hectare," says Vito, "which equates to around 75 tonnes per hectare. The carrots are grown for four months in the ground, which is then rotated on a three-year system with wheat, brassicas, and sorghum. "Following the carrots, we would min-till in wheat as another cash crop in the rotation. Next up, we sow brassicas and then sorghum, which are left to decompose as nutrients in the soil before returning the land back to growing the carrots. "When it comes to planting our carrots, we use precision drilling with the latest GPS technology and precision drilling equipment," says Vito. "It’s capital-intensive, though, as the machinery required for seeding and harvesting are specific to carrots. "However, as we harvest all year long, this reduces our expenditure as the machinery is being used more often," he says. Out in the fields, a self-propelled Asa-Lift carrot harvester lifts all the carrots into boxes on trailers. The carrots are then hauled back to the farm by a fleet of Valtra and John Deere tractors for processing. 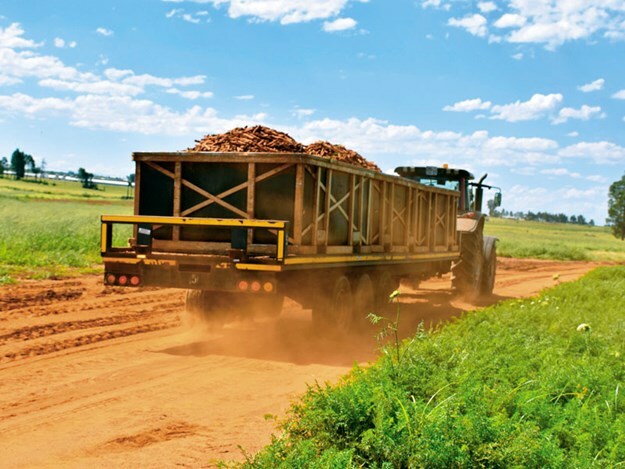 When harvesting is at the two furthest away farms, the carrots are transported to the Tarlton factory by truck. The farm produces in excess of 60,000 tonnes of carrots per year of which 75% are premium grade carrots for sale to the end consumer. The remaining 25% is second grade, which can be juiced. 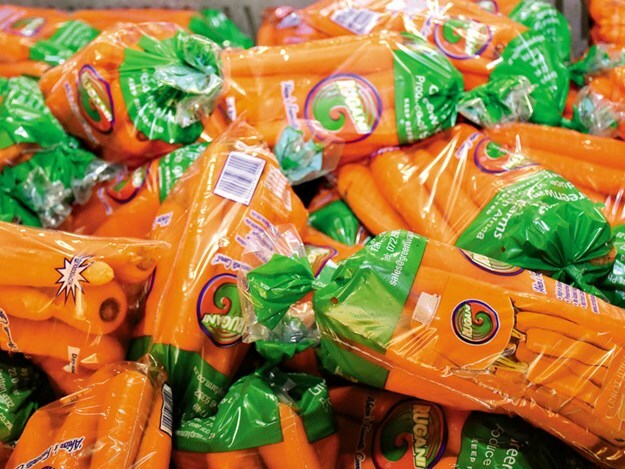 "We grow, harvest, and produce 50% of all the first-grade carrots in South Africa," says Vito. "These are sold mostly in one-kilogramme bags, and we supply them all year round. The carrot really is a popular vegetable here in Africa. "Using a process called hydro-cooling, Vito and his team can extend the shelf life of carrots from days to weeks. Carrots can thus be picked, washed, packed, and chilled to just 2°C within an hour, maintaining their quality and freshness. developed an extraction process that converts as much as 50% of the carrot into juice by rupturing its cell walls. It wasn’t long before Vito took the Italian extraction idea and started to fabricate his own juice facility in Italy before bringing it back to his plant in South Africa. 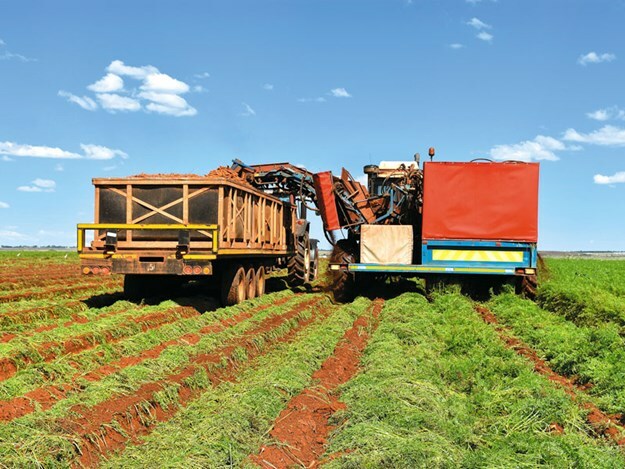 The entire project cost around Rand 100 million (NZ$10.21 million) and is set to produce about 145,000 litres of juice per week from about 240 tonnes of carrots. Using the vegetable pulp from the process, the juice plant is powered by a biogas plant reducing the energy requirement and bills. Vito’s Rugani carrot juice is pure vegetable juice with no added water, sugar, preservatives, or colourants. In fact, the only additives are a small dosage of ascorbic acid or vitamin C to ensure anti-oxidant and colour preservation, and lactic acid to keep the pH below 4.6 to ensure no botulism infection can occur in the bottle. "Our carrots are harvested in the morning and around four hours later they can be in juice form," says Vito. "Ours is the only carrot juice with over a year’s shelf life in the world. It really is taking off in the export markets but we would like to see it enter the UK markets starting off in London. "It takes around one kilogramme of carrots to produce half a litre of juice," he says. "We clear all our carrot harvest every year on the open market but can add more value to the second-grade carrots by juicing them. "Vito is currently exporting 30% of the total juice produced outside of South Africa and has three exciting new flavours coming to the market this year. "We are already in New York and Los Angeles in the US," he says. "But we are also in Cyprus, China, and our first shipment to Japan is on the water. In fact, over the past year, we have experienced a growth rate of 118% compared to the first year of sales. "We are preparing to launch three new juice flavours, including a 100% Zobo-infused beetroot juice, which is like a Hibiscus plant. Also coming is a 100% green juice that includes cucumber, pineapple, celery, and ginger, plus, a new turmeric-infused carrot juice.